Alexander Safford captures the livelier side of fiddle and blues music in this fun, fast-paced work. 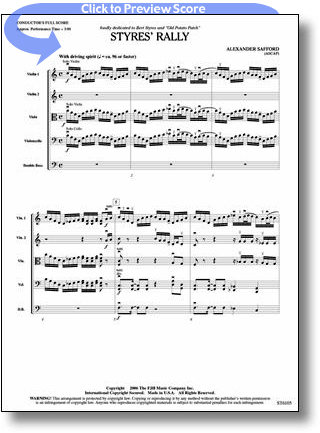 Each section of the orchestra is featured prominently in a piece that incorporates spirited rhythms, soli passages, and open-string double-stops. The piece eventually settles into a really hip groove (and no percussion required!) as it catapults forward in a bustle of energy. Outstanding music by a composer who truly understands the art of writing for strings!